People are often complacent and wait for too long before investing in retirement products. As a rule of thumb, it is always advisable to start planning early. India is often called a young country. As per the current predictions India’s youth population (15-29 years) is going to cross 45 crore by 2021 and thus by 2020 India is all set to become the world’s youngest country with 64% of its population in the working age group*(15-64 years), which is expected to be amongst the highest as compared to any other country in the world. While the facts stated above are quite encouraging for a developing country and a growing economy, there is also a flipside to these facts. In a few decades from now, India will have one of the largest elderly population. The United Nations Population Division estimates that the number of people aged 60 and above in India is estimated to grow from 8% of the population in the year 2010, to 19% in the year 2050 – which translates to 32.3 crore people who are aged and out of job and hence potentiallyincome-less and exposed to financial exigencies. While the above facts are disconcerting, what is shocking to know is the level of preparedness of Indians for their retirement years. According to a Max Life and Nielsen study, despite 60% Indians not having any retirement plan, 63% feel that they will have sufficient money during their retired years. It is difficult to make out where that misplaced confidence comes from when over 40% Indians are oblivious of the amount of money they would require for their retirement needs. All these should be seen in the context of a country where social security is grossly inadequate and where joint family system has given way to nuclear families. Further, health costs are rising where hospitalisation expenses have increased by 176% between 2004 and 2014. Hence, it is imperative for people to make their own arrangements to take care of their retirement needs.One of the options is to invest in a pension plan to save for retirement. Pension plans also sometimes known as retirement plans are investment plans that let you allocate a part of your savings to create a corpus over a period of time. People are often complacent and wait for too long before investing in retirement products. As a rule of thumb, it is always advisable to start planning early. The earlier one starts saving for retirement the easier it will be as the monies get invested over longer period of time,thus reaping the benefit of compounding. More specifically, some of the key factors to be considered in deciding the required retirement corpus are the person’s current age, retirement age and the estimate amount of money which would be required every month, post retirement. The effect of inflation on purchasing power needs to be factored in as well. Pension plans generally require locking in funds for a longer period which means the flexibility of withdrawal of money will be minimal. This inflexibility will ensure that the proceeds from the retirement plan is available only at the time of retirement and not used for other life needs that may fall before retirement. At retirement, generally the proceeds from the retirement plan are used to buy an annuity which provides a regular income stream to the individual and spouse in his/her retirement years. 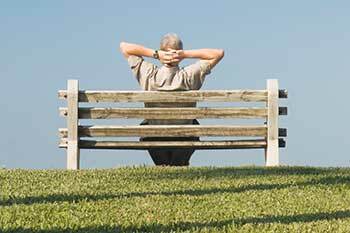 So, old age doesn’t need to be a time of frugality or dependence but with prudent planning, can well be a time of happiness and financial independence.